While various videos over the few weeks (including a fan description) has shown us snippets of Transformers: The Ride, the Los Angeles Times has now waded in with their own scene by scene breakdown of the attraction that will debut on December 3rd at Universal Studios Singapore. Scene 1: A mechanical Decepticon tiger named Ravage grabs the AllSpark, leaps onto Evac's hood and claws at the passengers. Evac escapes by driving erratically. Scene 2: Bumblebee, an Autobot that can transform into a Volkswagen Beetle, rescues Evac from the motorcycle-bot Sideways and entrusts the riders to protect the AllSpark. Evac flees the scene by crashing through a wall and plowing through city traffic. Scene 3: Megatron, leader of the Decepticons, attacks Evac before the Autobots' leader, Optimus Prime, comes to the rescue. During the battle, Evac's riders narrowly escape Grindor's spinning helicopter blades. Scene 4: Evac drives evasively as Megatron gives chase. The evil robot eventually captures Evac, who struggles and manages to break free. Scene 5: Riders feel the heat of a tremendous explosion after Megatron fires a missile at Evac, who maneuvers to avoid the oncoming shell. Evac escapes through a hole blown in the side of a building by the missile. 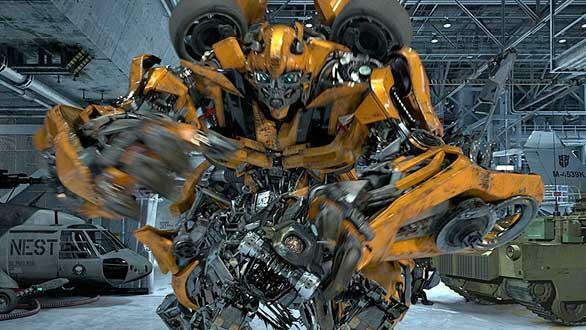 Scene 6: Evac gets sucked into a whirling vortex generated by Devastator, a Decepticon created by combining several robots. Scene 7: Sideswipe, a Lamborghini Autobot, saves Evac and the pair race through city streets battling Decepticons along the way. During the high-speed chase, Evac fires a weapon at Bonecrusher, a bulldozer Decepticon. Scene 8: Evac manages to escape a second encounter with Devastator only to be grabbed by Starscream's grappling hook. The F-15 fighter jet Decepticon flings Evac through the air, sending the hero robot crashing into a building. Scene 9: Optimus Prime and Megatron battle in a showdown between the alien robot leaders. Scene 10: Autobot helicopters fire on Starscream, giving Evac a brief respite. Scene 11: In the finale, Optimus Prime and Megatron continue their fight on top of a skyscraper. Falling from the building, Megatron pulls Evac over the edge with him and they hurtle headfirst toward street below. At the last possible moment, Bumblebee leaps up and catches Evac. Scene 12: With Megatron defeated, Optimus Prime congratulates Evac and the rider recruits on a mission accomplished. With the ride over, Evac heads to the unloading station where the passengers disembark. Starscream an F-15? In the movies he's an F-22! WTF is going on?! they couldnt afford the rights to have the movie vechile modes. In the pic Bumblebee is in Camaro alt. form, not beetle as said. Yeah I've seen small amounts of footage. Bumblebee is a camaro, not a beetle. Basically the LA times didn't really do their homework. They didn't actually ride the ride. They have the script of the scenes, but not knowing who is who and what is what, they pulled up the TF G1 wiki and used THAT as reference. I mean, we're not talking dedicated TF fans here; we're talking people who know NOTHING about cars and trucks and Transformers and busting out a quickie news article about the ride. LAME. Yep.That's what media does best. A lack of homework. I like mechanical Deception Tiger the most. Cool work, but another machines are good too. Ravage IS NOT a Tiger. He's a panther. I hate when journalists don't do their damn homework. You'd think since we live in an information age, that people would actually KNOW HOW TO FIND INFORMATION.